The largest and most daunting task: all of the steps involving prepping and shipping two large tandems to Seattle. After the parents finished their morning coffee, we all donned our very best bike touring apparel and wandered down to the hotel dining room for breakfast. Since we’d been touring and camping for 25 days, we all found the dining room experience an odd change. Yesterday the four of us woke in a tiny 4 lb bike touring tent in a crappy campground with dirty bathrooms. Today we awoke in a luxurious hotel room in beds adorned with Egyptian cotton sheets. And now we were eating breakfast in a dining room drinking fresh squeezed orange juice out of wine glasses. How did we get here? This feels normal but odd at the same time. At breakfast we discussed the plan for the day. Number one item on the ten item list: ride to the border. Before we checked any other task off our list, we had to finish the tour and touch the fence at Border Field State Park. We couldn’t even think about dismantling and boxing bikes yet, bikes were essential equipment for our ride to the border. After striking out with a few bike shops in the area, we called Amtrak and found out they had lots of boxes. We planned to pick one up when we returned from our ride to the border. Before we left Seattle, Tim, our family bike librarian, had researched shipping bikes. He sleuthed out all available options for long distance bike shipping: Amtrak freight, FedEx, UPS and various bike shippers. Turns out he didn’t need to put in all of that effort, Adventure Cycling site has a complete run down on bike shipping. We were pretty sure we’d go with Amtrak, as they seemed like the best (and cheapest) option. If we successfully completed all of our bike riding and bike shipping goals/tasks, we’d squeeze in some shopping or a trip to the zoo later in the afternoon. At this point in the day, I was hopeful one of these goals would happen. After breakfast, we ran back to the room to grab a few things for our ride to the border. We decided we weren’t going to pretend we were still on tour and load up our bikes with all of our panniers and gear. That would be silly. Instead we’d take enough stuff for a day ride: a few snacks, some water bottles, extra clothes and cameras. We claimed our bikes from the hotel manager’s office, walked them outside and pedaled toward the waterfront. We planned to follow the Adventure Cycling route to the border, which includes a ride on the passenger ferry from downtown San Diego to Coronado. But when we arrived at the waterfront terminal to catch the ferry, we learned the ferry wait was over an hour! Add ferry wait time to the time it takes to load and unload the ferry, plus the 15 minute ferry crossing — our hour and a half trip to the border turned into at least 3. With only 17 miles between the ferry terminal and the border, we figured could pedal all the way there in the same amount of time it would take to get to Coronado via the ferry. If we skipped the ferry, we’d be $30 richer and with more time for all the other items on our to-do list. Decision made. Tim quickly checked Google bike directions and found a bicycling route to Border Field State Park. 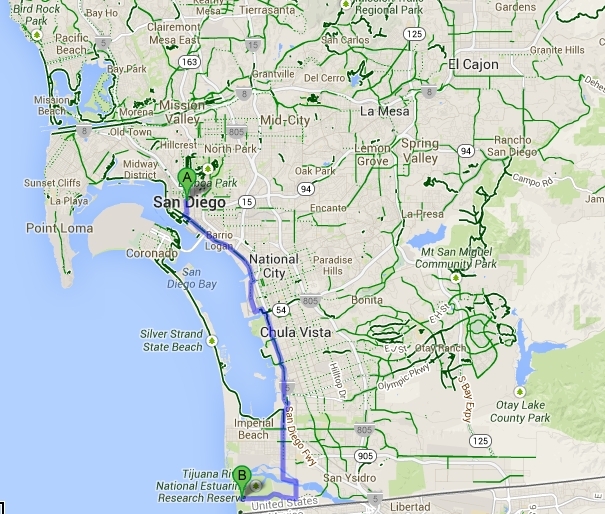 The ride from downtown San Diego to the border meandered through South San Diego on various bike lanes and paths. I wouldn’t say it was a pleasant ride, since the paths skirted traffic clogged streets and freeways. But we hardly noticed the less than ideal terrain nor the lingering smell of car exhaust. Our end-of-tour-rose-colored-glasses kept our moods chipper the entire way. With each passing mile, our grins spread wider. We were almost done! A mile or two from the park, we made one wrong turn that put us on a sandy path near some horse ranches. Luckily a friendly couple out for a day ride and also on their way to Border Field Park, made the same mistake. They flagged down some caballero looking dudes who gave us all directions to the park. As we neared the park, our anticipation grew. We looked up into the hills and wondered out loud, Is that Mexico? Where’s the border? Is that the park? After a stretch of pedaling into an intense headwind, we finally arrived at the park. The parking lot looked deserted. Perhaps the closed gate and mile and a half walk to the border is a deterrent for most people? Since we started planning the last leg of our Pacific Coast tour from Canada to Mexico, we’d talked about “the fence”. We’d read many different Pacific Coast bike tour stories and learned that many bike tourists who ride the route finish their tour by touching the fence that separates Mexico from the US. Our goal for months? To touch that fence. We’d been talking about the fence for weeks. “When we get to the Mexican border, we’ll touch the fence.” “I can’t wait to touch the fence.” What do you think the fence is like? As we pedaled up to the monument at Border Field State Park, the fence came into view, a massive military-looking structure. Wow, that’s some fence. That fence means business. We pulled up and leaned our bikes up against a half wall as we figured out what the park was all about. Other than the friendly couple we’d met on the road, the park was completely deserted. Except for the not so friendly Homeland Security Border Patrol Officer. He was sitting in his Border Patrol Jeep about 100 yards away from where we parked our bikes. We hadn’t been there more than a minute when he drove over to the spot where we leaned our bikes. He rolled down his window to tell us about a few rules. Stay away from the fence. If you go to the water, please don’t go beyond the fence. 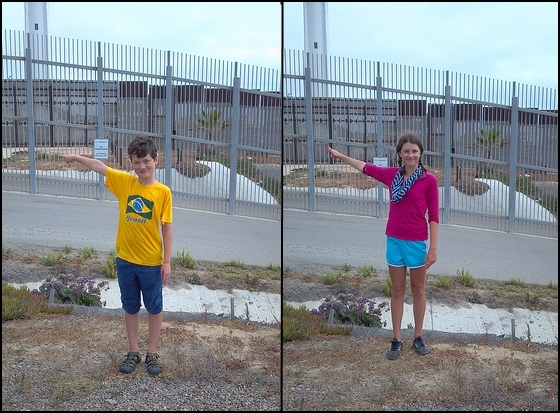 I naively told Mr. Border Patrol about our big adventure and told him we’d promised the kids they could touch the fence. So I asked, “Do you mind if we go over to the fence and touch it?” He scowled at me. And let me know in a very gruff tone that yes, he did mind. He minded very much. And no, we were not allowed to touch the fence. Needless to say, the kids were crushed. We came all this way, and we can’t even touch the fence? What harm could it do? Do we look menacing? Can’t he just stand next to us and watch us touch the fence? From that point on, we had a different view of that park. It felt more like a DMZ than a park. Meanwhile, on the other side of the fence and border, we heard festive music blaring. And people laughing. And kids playing. We saw families picnicking on the beach. There were food trucks. And bright colors. Why couldn’t we be on the other side of the fence? They are having the right amount of fun over there. Our side was just depressing. And of course snapped the obligatory family shot! Once we finished our photo shoot and since we didn’t have any reason to linger at depressing-giant-fence-park any longer, we began our journey back to San Diego. Since we were pressed for time, (remember the 10 item to-do list?) we hoped to catch a trolley back to San Diego instead of riding the tandems. We’d talked with several locals who assured us that the trolleys are usually empty and we’d have no problem getting bikes on. We arrived at the station, paid our fares and waited on the platform for the trolley to come. Memories of previous attempts to load large bikes on public transportation came flooding back. Why do we keep doing this? Is all of this stress really worth it? We should just ride the damn bikes instead of trying to load them on public transportation. We let a couple of trains pass since the cars looked full and we didn’t think we’d get the bikes on. When the next trolley came, we lined up at two different doors and made a commitment to go for it. We told the kids, once the door opens and people get off, we load. One kid with one parent, kids take the back of the bikes and help push the bikes on the trolley. We didn’t see the stairs. It all would have been fine, if the cars didn’t have stairs. And once we noticed them, it was too late. Even though the stairs caused problematic and stressful tandem loading (a complete understatement), we were able to wedge the bikes on the trolley. I’m certain I gained a few extra grey hairs and lost a few pounds during that 20 minute journey. At each stop I looked for transit authority, I was sure they were going to board the train and kick us off. And believe me, I think we totally deserved to get kicked off! We took the trolley to the edge of downtown and unwedged the bikes from the trolley and practically threw them off the train as the doors closed. Whew! Glad that’s over. As we pedaled toward downtown a guy watched us ride by and yelled, “Now that’s a cool family! Kids, your parents are cool!” That 2 sec interaction with a stranger brought smiles to our faces and helped erase just a little bit of lingering stress from that trolley ride. There’s a reason we do this. Not to “be cool” but to give our kids new experiences. And to show them how to persevere when faced with adversity. We stopped at a nearby grocery store for some lunch food before heading back to our hotel. The kids went up to the room to relax while the parents rode down to the Amtrak station to buy a bike box. Stay tuned for our final post about disassembling, boxing and shipping two very large tandems on the sidewalk in front of the hotel! This entry was posted in bikes, Pacific Coast Bike Tour and tagged "family bike tour", 2013, acapaccoast, bike tour, bike touring, bikes, Border Field State Park, CA, carfreedays, family bike touring, Family Cycling, kids, Pacific Coast Bike Tour, San Diego, tandem, tandem bike tour, two tandem bike tour. Bookmark the permalink. I absolutely love that 4th photo! you all look so happy!